Now in its 7th and final year of production, the second-generation 2013 Lexus IS still offers plenty of refinement, attractive styling and a range of engine choices. Owners will also appreciate this luxury sport sedan's strong residual values and solid reliability record long after signing on the dotted line. If you appreciate the aggressive styling of contemporary sports cars, but crave the refinement and comfort of a luxury sedan, the 2013 Lexus IS is tough to beat. It may lack the athleticism of a BMW 3 Series and trail the Mercedes-Benz C Class in terms of prestige, but the Lexus IS remains a well-rounded performer with exceptional reliability and value. If interior volume and rear-seat legroom are at the top of your list, you may find the Lexus IS less accommodating than its larger European rivals. In addition, drivers who prefer a generous helping of sport with a side of luxury should consider the BMW 3 Series, Infiniti G37 or the Audi A4. 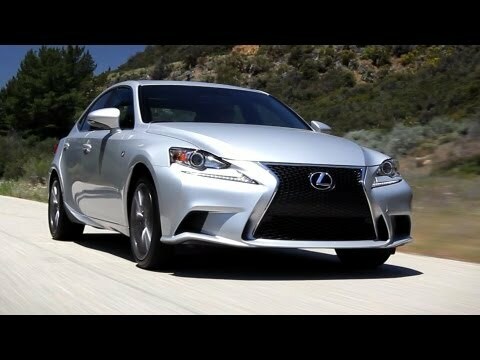 With an all-new model due out next year, the Lexus IS has only a few upgrades for 2013. IS models equipped with navigation now include Lexus' latest Enform infotainment system with automatic phonebook downloading via Bluetooth and HD Radio with iTunes Tagging. Additionally, the IS250's optional 6-speed manual transmission has been discontinued. As BMW and Audi interiors continue to gravitate toward mid-size, the smaller Lexus remains, well, small. The driver and front-seat passenger are well accommodated, and all seating positions are well appointed, but this is best regarded as a "personal" 4-door sport sedan, one which will never be confused with a family hauler. Of course, if you're in a Lexus showroom shopping for the family, the dealer has roughly a half-dozen better choices from which to choose. We like the personal feel of the IS, and the convertible hardtop offers unlimited headroom - with the top down, of course. The Lexus IS 250/350 body shell shown in March, 2005 was remarkable for its utter lack of adornment or distraction. A softened wedge profile, short overhangs and a raked windshield created a sporting 4-door that was almost coupe-like in its design. Opt for the IS F (or F Sport package) and things get more enthusiastic. The IS C hardtop convertible strikes, to these eyes, the only discordant note; in order to accommodate the folding hardtop, Lexus designers added an unsightly slab of bulbous sheet metal to the rear end. If the BMW's 3 Series serves as the definition of "sport sedan," then the 2013 Lexus IS 250 and IS 350 might be seen as the "Grand Tourers" of the category. While the Lexus IS isn't as engaging or nimble as its sportier rivals, all iterations provide a level of compliant composure the Germans rarely deliver - at least in this size category. Of course, what's under the hood will determine, in large part, where you peg the smile meter. The entry-level IS 250 focuses on practical characteristics such as fuel efficiency and ride quality, while the more powerful Lexus IS 350 borders on the visceral. As Lexus' first super sedan, the V8-equipped IS F makes a credible run at BMW's M3, and does it without earning the costly gas-guzzler tax. Given its mission, the hardtop convertible - with either V6 powertrain - is little more than a boulevard cruiser. The base Manufacturer's Suggested Retail Price (MSRP) for a 2013 Lexus IS 250 is right around $36,000, with the IS 350 coming in closer to $41,000. High-performance IS F variants are roughly $62,500. Although it features less standard equipment, the Audi A4 undercuts the Lexus IS by nearly $3,000, while the Infiniti G37 and BMW 3 Series will be about $2,000 and $3,000 over the IS, respectively. To see what buyers are actually paying for the 2013 Lexus IS in your area, take a look at Kelley Blue Book's Fair Purchase Price at the bottom of this page. Down the road, we expect the Lexus IS will maintain the best 5-year residual values in the segment. The term "bang-for-the-buck" is seldom associated with luxury vehicles, but with an attractive base price and long list of standard features, the Lexus IS offers perhaps the best value in the category. At its about-$36,000 starting price, the Lexus IS includes leather seating, smart access with push-button start, 10-way power front seats, power moonroof and a 13-speaker premium audio system. Opting for the IS 350 gets you xenon headlights that emit up to three times the light of standard halogen systems, a 306-horsepower V6 and beefed-up brakes. On the safety front, every Lexus IS includes eight airbags, built-in telematics with emergency services and hill-start assist, which prevents the vehicle from rolling backwards when starting off on a steep grade. Buyers looking to bridge the performance gap between the mainstream IS and the race-inspired IS F will find the available F Sport Package up to the task. Upgrades include 18-inch alloy wheels with a dark graphite finish, aggressively-tuned electric power steering, firmer suspension and a host of cosmetic adornments for both the interior and exterior. Technophiles will rejoice at the newly-available Lexus Enform 2.0 infotainment system comprised of HD Radio with iTunes Tagging and in-vehicle mobile applications such as Bing local search, OpenTable, MovieTickets.com, Yelp and Pandora Internet radio. In a segment offering all-wheel drive as an all-season prerogative, Lexus' approach delivers 70 percent of the engine power to the rear wheels under normal operating conditions. With that proportional distribution, little of the sport orientation is lost on dry pavement, while traction is enhanced on wet or slickened pavement. While the well-tuned standard suspension will please most buyers, Lexus' F Sport Package incorporates firmer springs and shock absorbers along with a recalibrated electric power steering system to elevate the performance of any rear-drive IS model to near-BMW 3 Series levels of agility and fun. Two technology-intensive, all-aluminum V6 engines provide clean and comparatively fuel-efficient motivation for the IS line. Both powertrains use dual Variable Valve Timing with intelligence (VVT-i) and direct fuel injection. The 2.5-liter develops 204 horsepower and 185 lb-ft of torque, sufficient to take a rear-drive IS 250 from zero to 60 mph in under eight seconds. The 3.5-liter V6 in the IS 350 adds secondary port injection and cranks out 306 horsepower and 277 lb-ft of torque. Backed by a multi-mode automatic with steering-wheel-mounted paddle shifters, it propels the fleetest member of the standard IS family from zero to 60 mph in about 5.5 seconds. If a zero-to-60-mph time of less than six seconds isn't quite quick enough, consider the IS F's 5.0-liter V8, and then go cruising for pink slips - or tickets. The all-aluminum 8-cylinder engine produces 416 horsepower and 371 lb-ft of torque, and is capable of launching the IS F from zero to 60 mph in 4.6 seconds with a top track speed of 170 mph. All engines require premium unleaded fuel. While it has a tendency to fly under the radar, the 2013 Lexus IS continues to be a formidable contender in the ultra-competitive luxury sports-sedan category. With the standard IS250 and sporty 306-horsepower IS350 at its core, the IS lineup also offers a hardtop convertible and a high-performance IS F variant designed to compete head-to-head with BMW's M3. Class-leading resale values and a reputation for exceptional long-term reliability make the Lexus IS a smart choice for value-conscious buyers. But, despite its sleekly-styled exterior and high value quotient, the Lexus IS has struggled to draw market share away from the Mercedes-Benz C Class, Audi A4 and the benchmark among sport sedans, the BMW 3 Series. Tires often need to be changed. I love it, required some maintenance. That can be costly. Besides that, it's amazing.